Fortunately I had fantastic field assistants with me, well capable of extracting the bird from the net and banding him. I managed to take a few measurements of the bird while they held him: my left arm, which is the side on which I usually hold a bird, was not interested in moving. 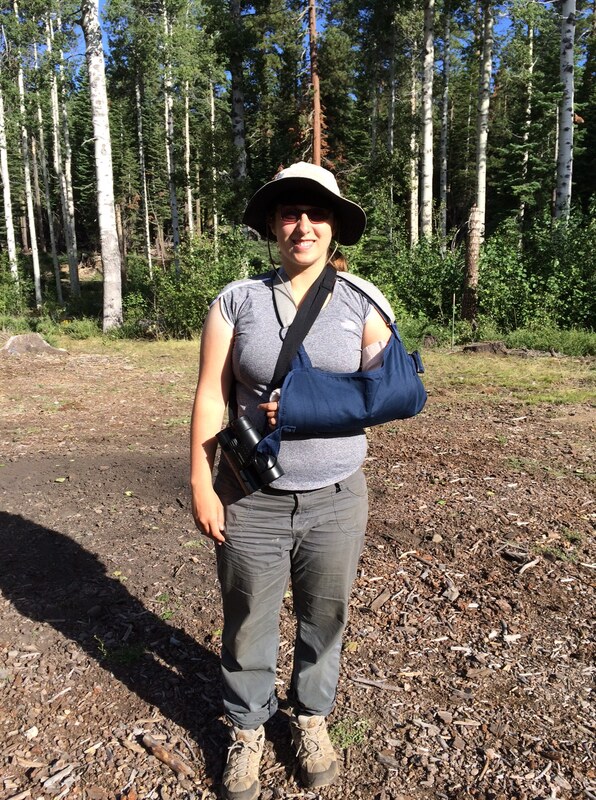 Thanks to the field assistants, we got almost all of our standard data from the junco despite my incapacitation. Then we drove to the hospital. At my institution, before you go out to do field work, you are required to fill out a form listing the nearest medical facility to your field sites. This forces you to actually find out what the nearest medical facility is: and this, my friends, is a good thing to know. It turned out that I had broken my left arm. The emergency room doctors wrapped it in a bulky, cast-like splint, gave me a sling, and told me to go find an orthopedist. But this was a weekend, and I figured that since I would have to wait until Monday for an orthopedist anyway, I might as well continue with the field work. We searched for nests the next day, and checked on nests we had previously found. Broken-armed field work turned out to be just as productive as the usual kind. In the end it wasn’t my broken arm that finished the field season, but a persistent rain that began to leak into our tents. We packed away our muddy gear, said good-bye to the juncos, and struck out for home. This entry was posted in field work and tagged field work, science by toughlittlebirds. Bookmark the permalink. It was fun to read your blog. Sorry that you broke your arm but you still look cute! After the day I wrote you about my baby juncos, they left the nest the next day, By the time I came to check their nest, they had gone. I was a bit sad since I was checking on them every day and felt attached to those cute little birds. Then I walked to my yard and saw the “family” but out of the sudden, a blue jay storming through a thick foliage tried to scoop off of a baby junco right in front of my own eyes. Of course I screamed and yelled at the jay trying to save my baby, so it disappeared through the foliage only to reappear to again attempt to kidnap my baby. I chased it again of course, and it flew away but you could tell it was a terrifying for the junco family. I heard the parents’ desperate voices calling out for their babies. I love plant so I have many pots everywhere in my garden, perfect for my juncos, but I noticed they flew over the fence and stayed there at my neighbor’s yard. After one of two days, I never saw them again. I still see juncos coming to my garden but not the family, I guess, because it should be 5 of them, of at least three. I only see a male or sometimes a pair, not a family. You get full marks for persistency! Hopefully you’re right handed.